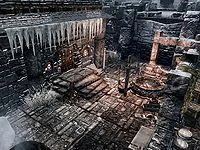 Blacksmith Quarters is a building on the east side of the market place in Windhelm that belongs to Oengul War-Anvil, the local blacksmith. It is home to both Oengul and his assistant Hermir Strong-Heart. The house itself does not serve as a shop; merchant services are offered at the forge area outside. There is only one zone, which is the interior. * This person will take over running the shop if Oengul War-Anvil dies. During the day both Oengul War-Anvil and Hermir Strong-Heart can be found working at the forge. There is a tanning rack beside the forge, with a grindstone and workbench further to the right and against a wall to the north is a smelter. Silda the Unseen will often use the forge as a source of warmth at night. Upon entering the property there is a large open-plan area with fire pit along the north wall with a cooking spit over it and a metal bowl containing three tomatoes on the floor beside it. To the left is a square wooden table with a joint of horse meat and horker meat on top and two baskets on the floor in front, one holds potatoes and the other three cabbages. Behind the table is a wall shelf with two garlic braids, two bunches of dried frost mirriam and a rabbit hanging from it. Beside the table is an empty cart. On the far side of the fire pit are three more wall shelves that mostly holding clutter along with an eidar cheese wheel. There is a chair in the northeastern corner and a long end table further along the east wall with a blacksmith's apron, a leather strip and iron dagger on top. Against the south wall are several crates and an unusable anvil. Against the west wall, on the right of the entrance when entering are a row of three weapon racks, all of which are empty. In the center of the room is a large round table holding a bottle of alto wine, a loaf of bread, an eidar cheese wedge and a tomato. There is a flight of stairs up to the second floor against the south wall heading to the east. At the top of the stairs is a large landing with a long wooden table against the east wall with an iron greatsword, a steel dagger, a hide shield and a banded iron shield on top. Against the north wall are a couple of bookcases holding sixteen common books including a non-skill version of Vernaccus and Bourlor, a bottle of alto wine and a bottle of wine and in the northwestern corner is a chair. against the west wall is a small square wooden table holding an iron sword and shield and a bottle of wine. By the stairwell is a small unit holding a bottle of alto wine and a leather strip. To the right of the bookcases on the north wall is a doorway through into a bedroom containing a fireplace on the south wall with two chairs arranged in front of it. By one of the chairs is a drum. To the right of the fireplace is a small set of shelves holding a bottle of alto wine and a bottle of wine. There is a tall wardrobe containing clothes against the west wall with an empty set of shelves to the right of it. Opposite the fireplace, out from the north wall, so that you can walk all the way around it, is a single unowned bed used by Hermir Strong-Heart, with a small, low table on either side and a long unlocked chest containing random items at the foot of it. In the northeast corner is a wash basin with a long end table against the east wall with a copy of Gods and Worship on top. With the exception of most barrels and sacks, all containers in the house are non-respawning, and you can safely store items in them.